Electrolux Line 5000 Tumble Dryers - Tri-State Laundry Equipment Co.
Electrolux Line 5000 Tumble Dryers with Compass Control - Tri-State Laundry Equipment Co.
We are pleased to announce the launch of the new Electrolux 5000 Line of OPL Dryers. This revolutionary new design using the Compass Pro control provides you with a long list of real benefits. You benefit by having cutting edge, axial airflow design, and an industry-leading energy saving story. It's an overall winner the industry will be talking about for a long time as competitors scramble to catch-up to the innovative features. The new Line 5000 Electrolux Professional dryers offer advanced performance innovation and significant energy savings. Now with easy to use Compass Control, it's perfect for hotels, motels, hospitals, nursing homes, gyms, salons, schools, and other facilities. You'll appreciate the "green" engineering, easy operation, and years of low maintenance. Energy Savings - Green Range, energy conservation features are in high demand. The gas savings range from 8-22% as compared to the T4 series, depending upon the dryer size. This is an outstanding opportunity for you to take the lead on the sale. This outperforms the nearest competitor by 13%. Labor Savings - While labor is the largest cost in operating a laundry, cutting cycle time is a verybig deal. The new design produces a finished load 20% faster than the nearest competitor! One Control - Compass Pro on both the washer and dryer makes the user interface intuitive. Reduce operator errors, while standard operating procedures are easier to enforce than ever before! 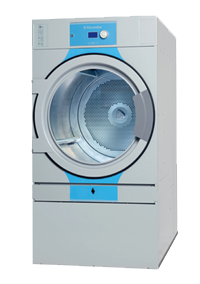 Features and benefits: - Full specs on the "Electrolux Line 5000 Tumble Dryers"